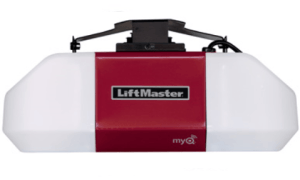 Each Liftmaster chain drive garage door opener comes with an inside wall unit, remote control(s), safety sensors, a solid one-piece rail, Liftmaster security garage door opener features. and MyQ® technology. Removal of your old opener is included, if needed, as well as complete installation of your new opener. Questions about what garage door opening system is right for you? Call 281-252-3346 to talk with a knowledgeable technician now. Receive email or text alerts about status of your connected appliances including your garage door. Download the MyQ® mobile app for free with no annual activation fee. Compatible with HomeLink® car systems. A bridge is available as an accessory if your older model car does not automatically link up with the garage door opener. When paired with the Liftmaster Internet Gateway, you can also control home lighting remotely. P3 Motors™ are specifically designed and built for use in garage door openers offering superior durable, powerful performance. The industrial-strength chain drive system delivers years of reliable, maintenance-free service. Standby mode offers low power consumption, up to 75% less. Security+ 2.0™ sends a new code with every click to the garage door opener, so the door opens only for you. Audio and visual warnings when the garage door is about to close keeps your family safe. PosiLock® guards against a forced opening. A powerful ¾ HP Chain Drive motor, I-beam rail system, and reinforced chassis lifts the heaviest of doors. Motor Vibration Isolation System (MVIS®) provides years of super-quiet, smooth operation. 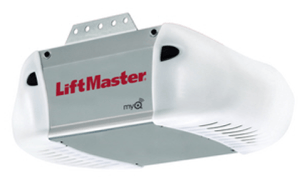 Security+ 2.0™ is a Liftmaster security garage door opener feature that sends a new code with every click to the garage door opener, so the door opens only for you. The Motion Detector feature turns on your garage door opener’s lights when you enter the garage.